From 2004 - 2008 Robbie Green played in the PDC but after a positive drug test he lost his sponsor and had to switch to the BDO. His biggest success in the PDC was it to reach the quarterfinals of the UK Open 2006. His till now biggest success with the BDO was it to be runner-up in the World Masters 2009. 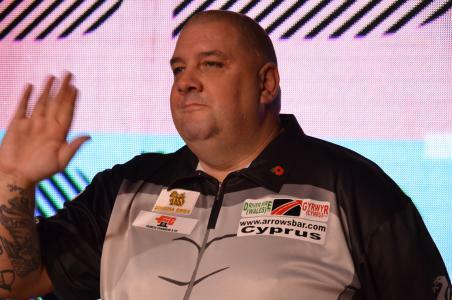 Green qualified several times for the BDO World Championship, his best result were the semi-finals in 2014. Due to this he was invited bei the PDC for the Grand Slam and reached the last 16. Already before the BDO World Championship 2015 rumours started Green planed to switch back to the PDC. Green played in the World Championship and was eliminated in the quarterfinals byCanadian Jeff Smith. Afterward Green took part in PDC Qualifying School and won a Tour Card by the ranking. 2010 he made darts history -he threw the highest ever three darts average: 128.82. Green is member of the English national team, he likes fishing, boxing and soccer. He's a fan of the FC Liverpool. Green's son Jamie Green plays darts as well, he qualified in 2010 over the pub qualification for the UK Open finals and takes part in the PDC Youth Tour.